I ordered four fruit trees this year, and we planted them a few weeks ago. I chose pixie crunch apple, sundance apple, honeysweet pear (which is self-pollinating) and a trugold peach. I am not sure if the peach needs a partner or not, but I am hoping to order more fruit trees next year anyhow, so I will get it a friend then. 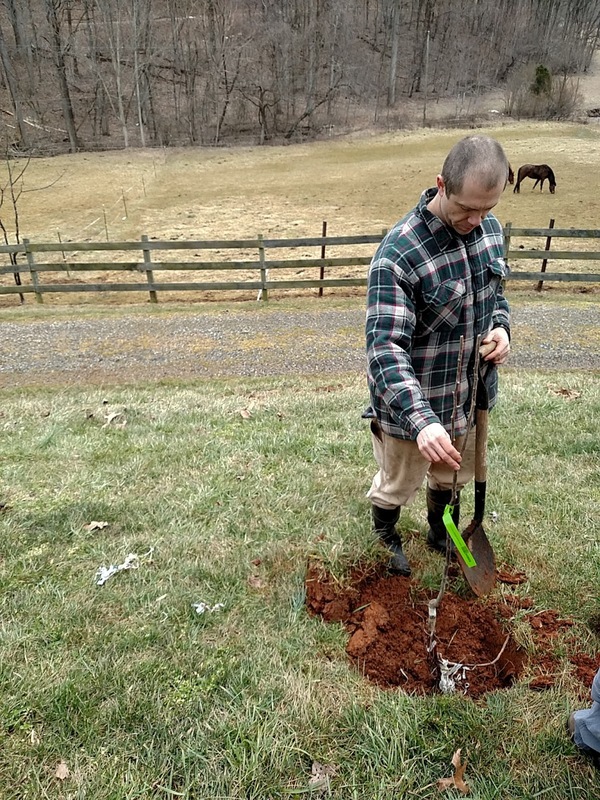 You wouldn't think the planting of four little fruit trees would cause a lot of drama, but Paul and I sure had a long, heated debate over where to plant them. It's kind of funny now. I'm happy with where we compromised on planting them, and hopefully he is as well. Hooray for neutral territory! Hopefully they will do well. Years ago my grandfather sent me two apple trees, and moles ate the roots. I still wish they had survived, and get sad thinking about them. We have outside cats on duty now, so that should help with the mole issue. Readers, do you have any fruit trees? I like that you compromised. I saw some avocado trees for sale yesterday for ten bux. I was seriously tempted. good that you were able to compromise :-) and I hope the cats do their job well and/or the moles have moved away. It is sad about your Grandfathers trees. Quite a few here. Planning on a few more this year too. Only one's I have had issues with are the Pear getting fireblight. We have a couple of mulberry trees... since we haven't much space we're debating what other fruit trees we might want to add. Have a few, want to add more. I want Damson plums, they make the best jam.I have had good luck with cherries, both sweet and pie.I have had good luck with Stark a MO nursery. I hope the trees do well. How many years before they produce? We have fruit trees in the park in town. They were planted as an Eagle Scout project, and the fruit will be there for anyone who wants it. I thought it was a pretty cool idea. A lot of people have never had fresh fruit--real fresh fruit. Sometimes hubby and I also disagree over gardening issues. We only have a small garden and I hope your fruits trees will grow well and be fruitful. A lot of times the moles will make tunnels while hunting insects and the mice will use the tunnels and destroy things. Of course it was the mole's fault for digging tunnels. I hope the stink bug problem is gone by the time the produce as I can imagine the preserves you will make with the fruit. How exciting. Fresh fruit is so awesome. Best of luck with your plantings. We have a lemon tree that had been struggling in a container planting. We moved it last year into the ground and then we cut it back. It is a little over 3 ft. tall now and has a bunch of flower buds on it right now. I hope some bees find it! I like to drink lemon water and always buy big bags at Costco. No 'arguments' here about where to plant the fruit trees....my husband takes sole charge and puts them where he wants them to go! Planting trees are a good investment for the future, and we plant several new trees each year. Hope the moles stay away from your young trees. Didn't know that cats hunt moles though! I don't, but my parents have a pear tree. Mostly it's a messy mess tree. :) I would like to have a few pecan trees...I think about it and then never plant any. I could have pecans for all the years I've been thinking about it! We have apple, pear, plum and our peach trees finally passed to the great beyond. We planted a couple more apple varieties last year. That looks like fun,,, (well it used to).. I think your trees will be happy! Do cats catch moles??? Gosh I hope so. We had a mole in the front yard last summer and that beast caused a ton of damage. I am hoping Owen is a hunter. We planted something called a patio peach this past fall. It has nice branches. Too soon to know if it will survive. GOod luck! I hope your trees give jars of sweetness for years to come! It's wonderful to have fruit trees. We have a couple apple trees and plumbing trees. We lost our peach trees to so sort of insect. I had unlimited orange trees as a kid. YUM! On our NC hobby farm, we have Peach trees that produce but are usually blighted (sad face), two Apricot trees that have never produced, and Pecan trees (if you call that a fruit ;) ) that produce like crazy! We have a peach that sits alone and is quite happy.. but the dang birds eat them before we can. It's awful to see the pecked holes in those beautiful peaches just before they are perfectly ripe for the picking. In short, we have found it's not easy growing fruit trees. Or, we're really not doing it right. We just have our Service Berry bushes, which look more like trees. They produce June Berries.